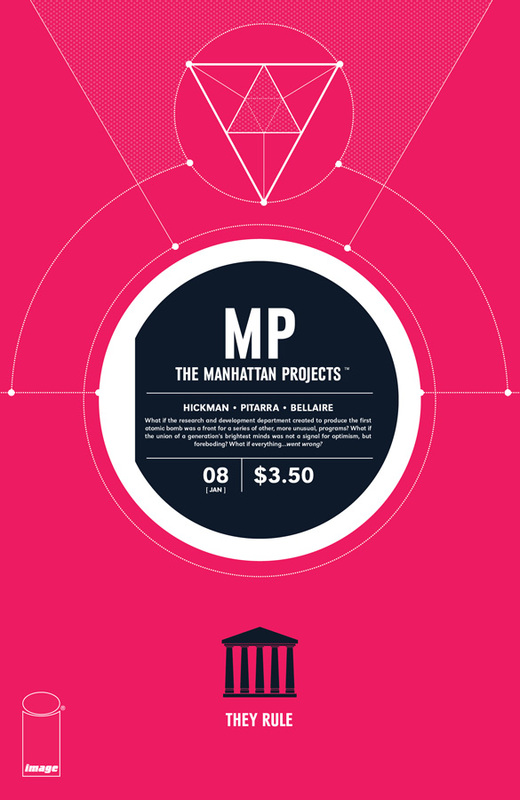 I will admit, the first time I picked up Manhattan Projects last year, I was a little apprehensive. I'd just met the artist, Houston native Nick Pitarra, and was intrigued by the setup he described, but it was definitely a stark contrast for the type of comic book story I typically enjoy--which is mostly superheroes. I was only mildly interested in World War II military, political and scientific historical figures, and wasn't sure their reinterpretations would hold my attention in the long term. But I enjoyed Pitarra's artwork, and saw it was written by Jonathan Hickman, so I knew I had to give it a chance. It's eight issues and nearly a year later, and I'm still reading. Hell, I'm always eager for the next issue to show up, and I'm very happy to say that anyone who gives this series a chance is going to love it. The cover to issue #8, entitled "They Rule," is, like its predecessors, a relatively simple graphic design that states the premise of the series right in the center. While traditional comics readers might want a little more flash on their covers, I think the theme really fits for this series, making for a somewhat foreboding introduction to the tale within. The red background is fitting for the war that begins in this issue, and the black columns at the bottom of the illustration make for a nod to the politicians and rulers of Earth who wage this war against the renegade scientists. So while it might not be the most stylish or elaborate visual, it nevertheless dovetails very nicely with the comic's theme. 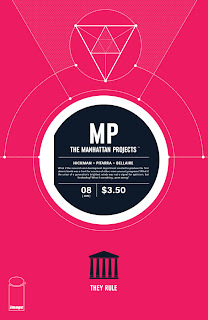 The scientists behind the Manhattan Projects and Star City have united, and attempted to remove themselves from the rule and oversight of Earth's leaders, who don't take kindly to being abandoned by their genius subjects. They launch an attack aimed at taking out the defectors, including turning the AI construct of Franklin Delano Roosevelt against them. Primarily written from Wernher von Braun's point of view, he and the scientists must defend themselves from FDR and the wrath of the world rulers, mostly by trying to disconnect FDR's artificial intelligence. The former president, however, is omnipresent, and isn't going to simply allow a bunch of traitorous inferiors to shut him down. I honestly feel that the further you get into reading this series, the better it gets. There was plenty of action in this issue--I mean, a war starts, for crying out loud--and it really keeps you turning the page. There's nothing quite like a mass of artificial constructs, all powered by a now murderous FDR, trying to take down a desperate group of scientists. Hickman's dialog is entertaining and detailed without being overwrought, and makes for some amusing situations, many of which involve fighting FDR. Einstein telling FDR that no real American would ever say "buggered," just before putting a bullet through the drone's head, made me laugh out loud, as did FDR exclaiming, "Horseradish," just before getting blown up by a grenade. Artistically, this issue was just as much a joy as the writing. Pitarra does a great job of making the action dynamic, intense, and in some places, just outright comical (i.e., the overzealous, murderous glee we see on FDR's face in almost every shot of him, or von Braun flipping FDR the bird). Pinkie promises among the world rulers, anyone? He also really nails facial expressions in the important places, such as FDR's final defeat, and Helmutt's mighty struggle to open the gate, much less stay alive. It's also worth noting that Jordie Bellaire's colors really help the artwork shine, giving even more depth to Pitarra's line work and intensifying the visual portrayals of the brutal conflict. Overall, this was a highly entertaining and praiseworthy issue in a series that has definitely converted me into a fan. The writing is outlandish and entertaining, while the artwork is stellar and serves the narrative ably. Highly recommended.